Kids & Youth snowboard bindings from The Board Basement Make sure that your snowboard boots are compatible with the snowboard bindings and that you get the right size for your little one. These snowboard bindings are designed to accommodate the younger riders We offer easy entry, regular two strap Youth / Kids snowboard bindings from Ride. 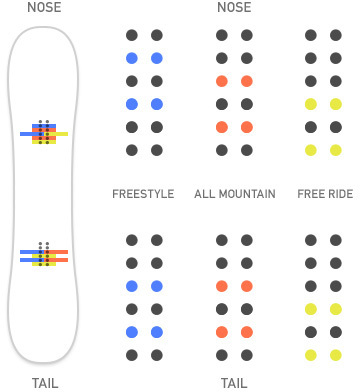 Use the filter on the left hand side to find the perfect kids snowboard bindings. Feel free to contact us for advice. Ask a friend, wife, husband or a next-door neighbour to stand behind you, and then gently push you forward. - The leg you make your first step forward with is usually the dominant leg. If you want to find out by yourself you can simply run and slide along a smooth surface. Your reflex will put your dominant leg in front. This is all down to personal preference and where on the mountain you are going to spend the most time. When you stand on your board, your feet will be spread apart. A narrower stance helps the board carve a turn better, while a wider stance will give you better stability. Riding powder? 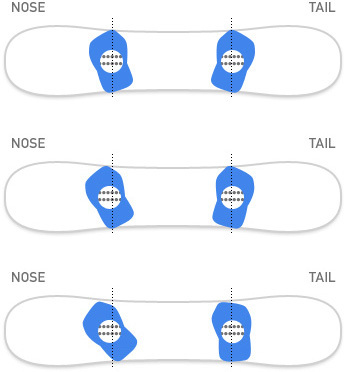 Set them back and you will increase the length of the nose of your snowboard, which will give it float in the pow. Playing in the park? Centre the bindings if you are planning to ride park, pipe and rails. It is a lot easier to jump and ride switch (backwards) when the bindings are centred. Doing a little bit of everything? Set them back one step. How wide / narrow should they be? Step onto the board (Without bindings attached) as you would go riding. If it feels good and natural, this is where you should mount your bindings. If you can't decide then you can do it roughly as far part as your shoulders. In the end it is all down to comfort and choice. Do not be afraid to change your stance and play around with it. There are many tool stations on the slopes where you can change your bindings. All you need is a screwdriver. You will soon find what is best for you and your riding style. Most snowboards all ready come with a recommended stance marked on the board. The most common and possibly the most versatile one is what is some times refered to as duck. The front binding registers a positive angle while the back is set to a negative. This will allow you to ride switch and regular with equal ease and delivers a stable comfortable stance. If you are just blasting down the mountain and not even thinking about riding switch then you might prefer positive angle on both front and back foot. Most riders do not bother using this feature. Forward lean describes the angle at which a binding's highback is set. The Highback is there to transfer power to heel edge of the board and the greater the angle, or forward lean, on the highback the greater the responsiveness delivered to the heal edge. If you are a beginner, I would not worry about this too much for the moment. It is down to personal preference and something you can play around with as you progress. Some instructors use this as a tool to help riders bend their knees. Make sure your boot size is compatible with the binding size you choose. At the board basement you can select your boot size to find the binding size that is right for you, using our filters. Most bindings are traditional Two-strap bindings, with an ankle strap and a toe-cap strap. Flow Bindings and SP Bindings have a reclining highback which means you can enter the bindings from behind with ease. These are referred to as Fast Entry bindings. Ideal for the little ripper out there. Essential learing tool for the youngest out there! A great kids binding for a little ripper.